The path leading to girl group f(x)’s first exclusive concert has been a long one. It has been nearly seven years since their debut and in this time, the group even lost one of their members. However, the group did not disappoint, delivering a stellar performance at “Dimension 4 – Docking Station” on the final day of a three-day concert at Olympic Hall in Olympic Park, Seoul on Sunday. They kicked off with the lead track “Electric Shock” from their second EP and delivered a 34-song set that was divided into medleys of four to seven songs. The opening set was dramatic and skillfully choreographed, aptly showing off f(x)’s well-coordinated stage showmanship. The second set featured f(x)’s debut track “LA chA TA,” their hit song “Danger” and two ballads “Beautiful Goodbye” and “Sorry.” In this set, f(x) mixed tracks of different genres and put together a theatre-like performance in a classroom setting. The atmosphere turned sugary sweet and colorful in the next set, which featured the songs “MILK,” “Ice Cream” and the lead track “NU ABO” from their first EP. 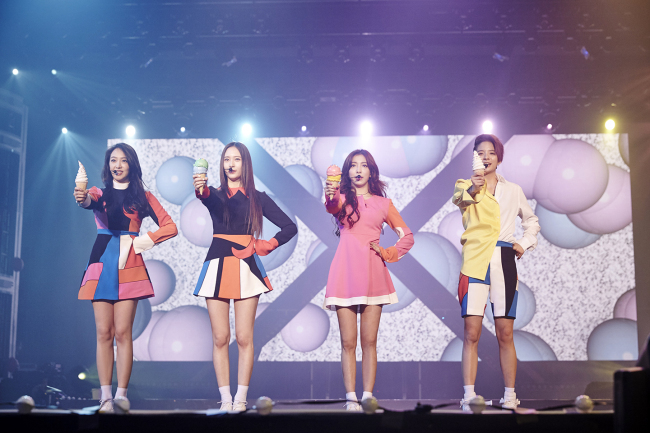 The concert’s first three sets appeared to trace f(x)’s history and back-up dancers were used to fill in the five-member dance choreographies that had once included former member Sulli. The mood shifted in the the fourth and fifth sets which were designed to bring f(x) up close and personal with fans. The members made full use of the concert hall, fanning out across multiple stages to interact with the audience. They even split up into pairs to run through the standing area on the upper deck, flanked by security guards as fans reached out to give them high fives. There was even a raised stage on the second floor, where the members performed three full songs to allow the fans on the upper deck a better view of their performance. Rapper Amber was the life of the party, going all out and letting all inhibitions go in order to bring the crowd to their feet. Another highlight of the evening was the announcement that after nearly seven years, f(x) finally had an official name for its fan club -- “ME U.” This was greeted by roaring approval from the audience who cheered every time the members addressed them with “ME U”. The final set of the night began with “4 Walls” and included songs from the group’s latest album. The group partied energetically with their fans, jumping along with them and showing no sign of fatigue despite Sunday’s performance being the third day of the concert. Although the breaks between the medleys were a little on the long side, f(x)’s “Dimension 4 -- Docking Station” was an impressive feat by SM Entertainment’s Performance Director Sim Jae-won, who successfully packed seven years of f(x)’s history into a two-and-a-half-hour show. He was also behind BoA and EXO concerts. As the name of the concert suggested, the performance was meant to be a landmark commemorating a beginning and a show of determination for f(x) to stay strong as a quartet. Also making an appearance at the concert was a new mascot named KLAV, a cube-headed figure that got its name by combining the first letter of each of the f(x) members’ names -- Krystal, Luna, Amber and Victoria. The members have pursued individual activities between albums. Victoria is currently shooting a drama in China, Luna has just released a solo single, Amber is writing music and Krystal is modeling for picture spreads. Despite these pursuits, they also have group performances lined up, starting with a tour in Japan that will take them through Tokyo, Fukuoka, Osaka, and Nagoya, from Feb. 20 to Feb. 28. It is clear that f(x) has no plans to slow down anytime soon.